Can I get a free review of my MRI report and also the actual MRI? Yes ! Patients can fax in their written MRI reports and also send in their actual MRI for a free review by one of our medical staff. 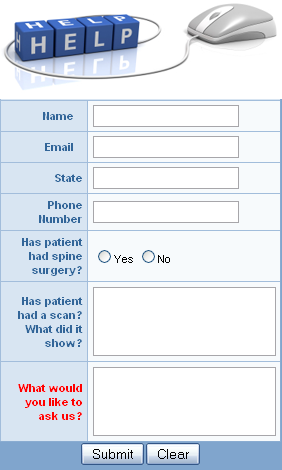 Potential patients can contact us by phone or by filling out the online patient form on our web site. A patient advocate will answer any questions. 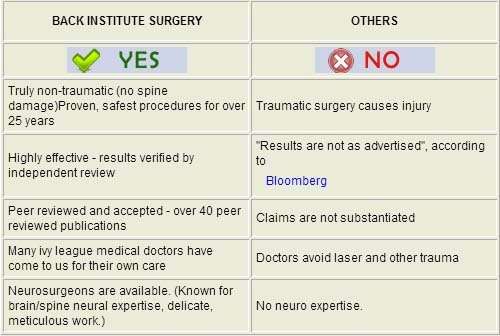 Back Institute medical staff will determine if you are a candidate for a Non-Traumatic Discectomy or another procedure. Back Institute offers a comprehensive analysis of the spine and our center treats all spine problems. We treat spinal conditions with the best procedure done in the least invasive way possible anywhere in the world. 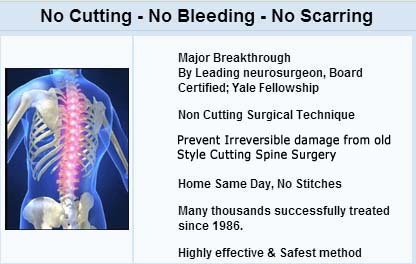 The advancements in proprietary equipment and totally non-traumatic techniques that the Back Institute has made over the last 20 years make us the leader in performing Non-Traumatic Spine Procedures. Many surgeons around the country, even in the biggest centers, claim to do minimally invasive spine surgery when the fact is they are just beginning to learn how to do it. The problem is that the words "minimally invasive" have lost their meaning from over 20 years ago when the Back Institute pioneered the techniques. Today, surgeons around the country are using smaller openings in their procedures, but they are missing the point to "minimally invasive," which is not to cut muscle, not to cut and remove bone, not to cause scarring, and not to alter the normal anatomy of the spine to get to the problem disc area. Spine centers around the country rely on clever marketing and catchy words like "laser" to attract patients, but they are missing the experience, expertise, credentials and technology to do a Non-Traumatic Procedure. In fact laser is rarely needed in any of these procedures, whether done at the Back Institute or elsewhere. 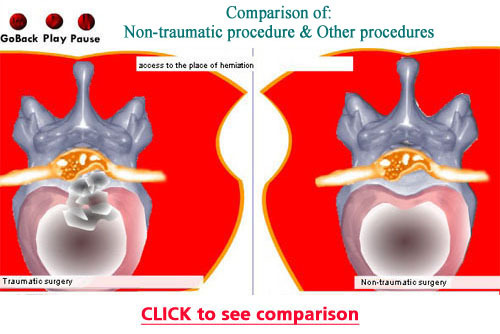 Back Institute is the only center in the world that can accomplish these truly Non-Traumatic techniques, and that is why our procedure is a "Non-Traumatic Discectomy."